17 cm/ 6.5" High-End Woofer-Midrange - Fiberglass Cone - 8 Ohms - Copper Control Rings for lowest distortion. 33 cm PRO-STUDIO Woofer of highest Quality! Identical replacement for old HD33S66 drivers. Otherwise SPECIAL ORDER item - leadtime ~4-8 weeks. 38 cm PRO-STUDIO Woofer of highest Quality! Identical replacement for old HD38S100 drivers. Improved version 2009! 25 mm / 1" NEODYM High-End Textile Dome-Tweeter - Back Chamber - SPL 95 dB! 34 mm Textile-Dome - world-famous, used by BBC! NOW latest improved version XP-D! As of now TW034XP will be replaced by XP-D (Damping). We have filled in a felt damping in the cavity below the air gap. As a result, the dip ~2 kHz caused by the cavity-resonance is improved, also Waterfall / Etc was slighty optimized. Resonance is reduced to 700 Hz. Proraum GmbH is your partner for first-class speakers and audio electronics from Audax - Auris - BG Corp. - DEQX. For more than 35 years professional speaker development has been our PASSION. In Bad Oeynhausen (North Rhine-Westphalia), we have a cutting-edge acoustics laboratory with a large Anechoic Chamber. We analyze drivers and develop finished speakers of the highest quality - not mass production units, but World Class systems! ( Tweeter, Woofer, Midrange ) We see ourselves as the noble blacksmiths offering select designs, individually crafted for perfectly matched speakers. Our speakers are available exclusively via Factory DIRECT Sales. This saves you about 40% compared to commercial sales prices! Demonstration can be arranged for your personal LISTENING with us, as we have an excellent sound studio according to standard control-room guidelines. Please contact us for an appointment. We analyze drivers and develop finished speakers of the highest quality - not mass production units, but World Class systems! We see ourselves as the noble blacksmiths offering select designs, individually crafted for perfectly matched speakers ». 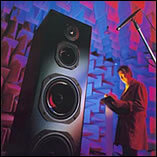 Our anechoic chamber, with 390 m³ volume and 70 Hz cut-off, is one of world's largest in the speaker industry. The professional acoustics laboratory is equipped with computerized analog and digital Analyzers.